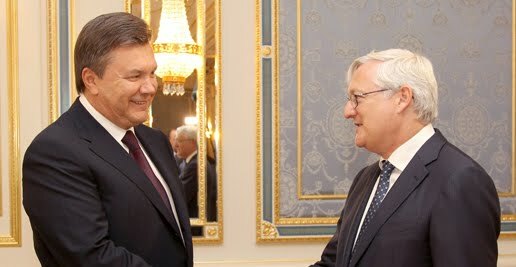 KIEV, Ukraine -- BBC, Financial Times, The Globe and Mail, The New York Times, Reuters, The Wall Street Journal and a number of other global media representatives draw public attention to the signing of the production sharing agreement between Ukrainian government and the Royal Dutch Shell. Ukrainian President Viktor Yanukovych (L) with Shell Chief Executive Peter Voser. According to the agreement, Shell and Ukrainian state company Nadra Yuzivska have equal shares in the enterprise - 50 percent. "A new project has been born. This is just the beginning, we shall continue this cooperation," commented Ukrainian President Viktor Yanukovych at the January 24 signing of the agreement in Davos, Switzerland. The document is supposed to promote investment to Ukraine, help increase domestic gas production, create jobs, lift the economy, and boost state budget revenue. Reuters emphasizes the 50-year contract is "the biggest contract yet to tap shale gas in Europe," noting that the USD 10 billion deal is a significant step on the road to energy independence from Russia. Reportedly, Ukraine possesses 1.2 trillion cubic meters of shale gas - third largest deposits in Europe. The Wall Street Journal reminds that Ukraine is putting extra effort into exploring domestic gas reserves due to high prices for imported Russian gas. As the country stays committed to European integration, Yanukovych rejected Russia's offer of cheaper gas in return for closer economic and political cooperation of the neighboring countries. Neil Buckley of the Financial Times believes deal with Shell could promote investment to Ukraine. He reminds that in 2013 Shell alone is committed to invest USD 400 million. Criticizing political and economic environment in Ukraine, the author notes that reduced energy dependence of Ukraine could give a push to closer integration with the EU. This, in its turn, would "alter the investment environment" in the Eastern European country. The New York Times quotes London-based Lambert Energy Advisory expert, who notes that large energy companies recognize "the huge potential of the country." The paper compares Ukrainian gas estimates to those of Algeria, seventh largest gas exporter. Shell won the right to explore gas in Yuzivske gas field in Eastern Ukraine in May 2012. In August 2012, Shell, ExxonMobil, Romanian OMV Petrom, and Ukrainian state company Nadra received joint rights to develop underwater deposits at Ukrainian deep marine shelf field under the Black Sea.